Let me start with a bit of English self-deprecation. An old friend of mine once remarked, in connection with another opera company, but it applies here, that with opera one should never lose one's nerve. 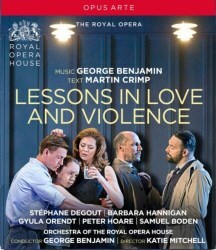 My nerves were immediately tested because George Benjamin and Martin Crimp's new opera Lessons in Love and Violence breaks my first rule of opera production, to make it look on stage at least roughly appropriate for the plot line. The other obstacles to overcome are: don't write operas in English because it isn't a good singing language, and lastly, don't write operas and be a living composer and librettist because the best operas are by dead people. All of which adds to my delight at this brilliant work. I am so glad that Benjamin and Crimp pay no attention to any of the above because they have given us a gripping sung drama which must surely place them in the vanguard - though I think, after Written on Skin, they are already there. Lessons in Love and Violence derives its plot from Marlowe's Edward II, an early history play written in 1593 and first published under the title The Troublesome Reign and Lamentable Death of Edward the Second, King of England, with the Tragical Fall of Proud Mortimer. Martin Crimp's text could be similarly described in outline but it has a modern setting and it focuses on the king's relationship with Gaveston and with Queen Isabel. It is packed with subtle understanding of both these destructive relationships and its effect on the Prince and Princess, "Boy" and "Girl". In the accompanying booklet interviews, Crimp notes the significance of his opening line: "It's nothing to do with loving a man, it's love full stop that is poison." The lessons are for the characters, not the audience. We just watch in growing horror as the corruption spreads until, at the end, the new young king shows the grim results of his learning. The dramatic impact is enhanced by the regular use of shots from a camera vertically over the stage. The audience could not have enjoyed these views of course but on film they are always dramatically informative and it looks as if the stage direction was partially planned with these moments in mind. Even without the aerial shots the staging is never dull. The rooms in a modern palace are minimally decorated, often have chairs, tables and beds, and much use is made of a large fish tank as a giant backdrop against which the effects of the love and violence on the children are reflected in their personal interactions. These are presumably the work of the Movement Director Joseph Alford who also uses slow-motion effects with his live cast to great effect. The extent of the integration of staging, filming and choreography is impressive and greatly enhances the impact of this truly awful tale. None of this would matter much if Benjamin's music were not so good. He achieves with a large orchestra an ebb and flow of tension and a mixture of lyricism and dramatic effect. It would be good to say that his music is like someone else's so as to prepare a new listener, but I cannot think of another composer who writes like this. The music is definitely modern, it is often beautiful and frequently dramatic. It manages to entice one into the story with intriguing sounds and a lot of musical eventfulness to keep one listening. The score fascinates the ear, much like Ravel's for L'heure espagnole and L'enfant et les sortilèges but never sounding remotely like the Frenchman. The cast is absolutely superb. Barbara Hannigan floats many high passages with her usual, but nonetheless remarkable, skill. The three important male protagonists have beautifully clear voices. The chorus, in several different guises, contribute much to the excellence. The orchestra, conducted by the composer, are marvellous; totally at home with this complex score. All this is captured with great clarity of both sound and video. The engineering team have all performed their roles with the highest professionalism. Still more remarkably - this was the world premiere performance! A triumph for the Royal Opera House, Covent Garden.